1) When your favorite team has the worst record in baseball, as the Orioles have for most of this season, people feel genuinely sorry for you. They might not know anything about baseball, but they know you are sad and they might even bring you some chocolate to help cheer you up. Having the worst record in baseball is terrible, but it’s really great if you like chocolate. 2) If you only have the second-worst record in baseball, the pity chocolate dries up. No one cares. Being second worst is actually the worst because … no one feels bad about how bad you feel. 3) When your shortstop – one of the best in baseball – is traded to the Dodgers during the All-Star break for five prospects of varying skills, there are a couple ways of looking at it. First, five players are, in net weight, hundreds of pounds more than one player. Advantage: Orioles. But, five prospects may be, in net value, not better than one extraordinary All-Star shortstop. Advantage: Manny Machado, because at least he no longer has to play for the team with almost, but not quite, the worst record in baseball. Goodbye Manny. We love you. 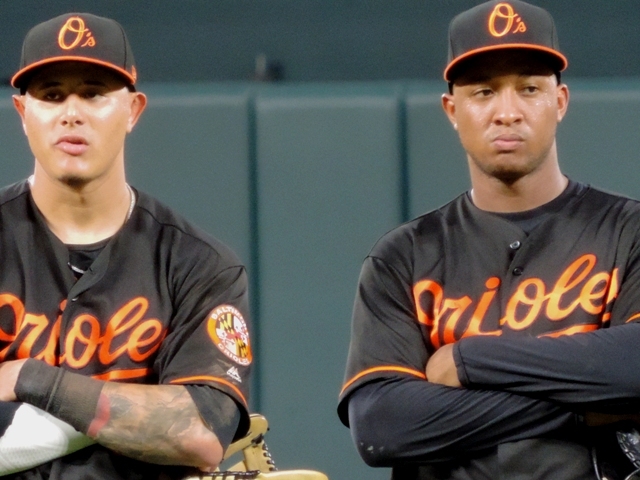 Let’s let now-former Oriole Manny Machado and his BFF and still-Oriole Jonathan Schoop sum up Baltimore’s disappointing first half for you . Hi guys. Just wanted to do a quick catch-up before the games start up again tomorrow. OK, so you don’t have a shortstop anymore. So what? Lots of teams don’t have shortstops. France’s soccer team? No shortstop and they just won the World Cup. The United States men’s curling team has no shortstop and look at them … gold medals! The Dodgers apparently didn’t have a shortstop until last night and they’re in first place! Sure, the Orioles purge of players (what you politely call a “rebuild”) has just begun. You’ve got 12 days and if you keep focused you could, conceivably, trade the entire team. I hope you don’t do that. This season isn’t going to get any better, is it? But, my beloved almost-in-last-place-but-not-quite darlings, it doesn’t have to get any worse. Not to set the bar too low, but how about this: Let’s try not to lose 115 games. Do it for me. Do it for Jonathan Schoop who just lost his best friend to the Dodgers. And, do it for Royals fans. Sure, it’s no fun having the worst record in baseball, but the bounty of delicious pity chocolate from friends will make it all better. This entry was posted in Baltimore Orioles, Baseball and tagged Baltimore Orioles, LA Dodgers, Manny Machado by Jackie, The Baseball Bloggess. Bookmark the permalink. It’s very frustrating to have your team give up with half a season left. Doesn’t make you that anxious to watch, no less go to the ballpark. I’m waiting to see if the Mets do the same thing. Last season the Mets unloaded most of their veterans mid-season. So then the off-season comes along and what do they do…they sign even older veterans, guys that other teams just let go. I’m waiting to see if there going to trade the two ace pitchers. I think the right way to go about unloading a team is to get as many top prospects as you can. Unloading a team then the very next year getting other veterans shows that management might not have trusted the prospects or they just got anxious and wanted quick results. Building a team like the 2015 Royals took years of patients, they did very little shopping of players who they knew would contribute immediately. I’m puzzled by the Mets, too. There should be so much more there, there. And, I don’t know why there’s not. But, I do always quietly roll my eyes when teams off-load veterans who play important leadership roles in the clubhouse. Those intangible contributions are sometimes as important as the contributions in the box score. Curtis Granderson seemed to be a good fit for the Mets in that role. But, the emotional AL East fan in me will say: The Mets should never have signed Jose Bautista — he’s cursed. Agree on Granderson. One of the things that the analytics are never going to be able to tell you is the value of someone who is a good guy. Embaressed to say I fell asleep and missed all the All-Star home run fireworks. *sigh* sad but true. Well, let’s get ready for the second half! Maybe your Orioles will have a surge and overtake the Yankees…. that would certainly be good for my Red Sox! I like what the O’s are doing… they’re almost definitely not even going to make the playoffs so why not get as much as they can out of one of their star players? If two of the prospects they traded for turn out to be HALF as good/ valuable as Machado then they’ve made a profitable deal on their part. Potential is a great thing to trade/ draft for. It’s cheap and can have huge payouts in the future. Obviously… if the prospects turn out to be duds…. they’re going to look stupid. The Orioles are used to looking “stupid,” I’m afraid. But, every trade and signing is an opportunity! I think that O’s fans are now counting the bounty of the Manny trade. Dodgers fans are worried they they sold too much for a three-month rental. The problem is a bit bigger than this trade — the problem is that the smaller-market Orioles never had the thought in mind to sign Manny to a deal. That’s the disappointment. The rumor is they never even really tried. To compete with the Yankees and Red Sox in the AL East on a shoestring budget is nearly impossible. I know more trades are coming in the next 11 days before the trade deadline. I worry if the Orioles choose to trade Adam Jones, the veteran in the clubhouse and quite clearly the heart and soul of the team. Clubhouse leadership is vital if you’re going to start a rebuild. That’s why the Astros went out and got Carlos Beltran. You need someone with the wide breadth of experience and a solid team presence to help turn all those prospects into a real team. I give Adam a lot of credit these past few seasons for helping turn Manny Machado from an extraordinary, but raw, talent into a poised and eloquent player, team leader, and community spirit, who handled the pressure of this impending trade with maturity and poise … and never let it affect his game. I will be happy-sad if/when they trade Adam. Sad … for the Orioles will be much poorer for it. Happy because Adam will thrive with a team that can take him far in the post-season. He deserves that. Last I’d heard, the Brewers were considering a move for Machado. Hmmm. Let’s hope our slide stopped with the All-Star break. We’re not second worse, but second to the Cubs stings in its own special way. Hey, Wendy … don’t give up. The Orioles fire sale is on and there are lots of players that might meet the needs of your Brewers. Relievers? Sure, we’ve got loads and some of them aren’t even on the DL. Position players? What do you need? Infield? Outfield? We got ’em and they’re priced to move! So swing by Camden Yards and kick a few tires — we can set you up with the team of your dreams. And, if you act now, trade for one player and we’ll throw in Chris Davis for free! This offer won’t last. Let the Orioles turn your team into a post-season power. This offer expires at midnight, July 31. Don’t Delay. Oriolize your team today! Hey Jackie, I feel your pain. When I heard the trade was made, and saw what the O’s got for Manny, my first, gut reaction was “what a great trade for the Dodgers”. They really didn’t give up all that much. None of these guys are top prospects. When the Cubs traded to get Chapman to make their run in 2016, we had to give up quite a bit. I really want to see the O’s on top of the AL East, but they have a lot of spots to fill. Those O’s are really putting your yoga equanimity training to the test! Yusniel Diaz was the big “get” for the Orioles … with their clunky outfield in flux. I think he plays all 3 OF positions well and clearly has a bat with power potential. He was one of the Dodgers top prospects and seems to be exactly who we wanted. Since the Orioles didn’t have to cover any of Manny’s salary and walked away with one solid prospect and four so-so other guys, I think the O’s did ok. Since the Brewers and Phillies kept sweetening the pot in the past couple weeks, so did the the Dodgers, so I think the prospects are better than they might look on paper. The O’s have, in the past, just said, “No,” to what they considered inferior offers (witness them turning down the Astros on Zach Britton last season). So, the Dodgers have a 3-month rental who will get them to the post-season and the Orioles get maybe kinda-sorta something for a rebuild. The O’s weren’t about to sign Manny to a long-term deal — he’s too expensive for a small-market team — so I guess I’m happy we got something for him. Now, we’re going to deal everyone else … it will be interesting. Yeah, Diaz was definitely a good “get”. I’m sure he will make O’s fans proud. Sounds like a solid prospect. I just think if they had waited til closer to the deadline the pot would have been even sweeter. They were really in the drivers seat. Funny, in so many ways, making these trades is like a game of poker! I thought that too … why not wait and see? I heard the Dodgers GM say that they sweetened the pot to get the Orioles to act more quickly. Not sure which of those second-tier prospects were the sweetener. I’ve never had to watch the O’s do a wholesale rebuild … this is all new to me. But, I know more there are definitely going to be more prospects are around the corner. I need to start writing all the names down, because I can’t keep track! You’ve invented a new word for baseball management– Oriolize! But I don’t think I love it. And about chocolate, in my house it’s the “go to” for happy, sad, sunshine, rain, or “just because.” You keep your head up for your O’s. Let’s just hope they build a team that plays well and loves to play. Yes, the Oriolization of a team is bound to lead to disaster and bitter bitter disappointment. Thanks to my tanking Twins dropping three to KC, the Orioles are now at the bottom of the cellar. Don’t fret, the Twins will be there soon. I hope my friends have noticed that the O’s are back in worst place — and commence the gifts of chocolate.